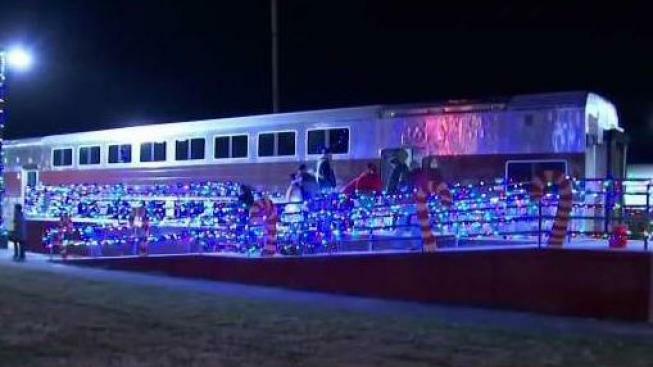 Two people were killed on Saturday night after being struck by a holiday-themed train filled with over 300 passengers in Wareham, Massachusetts. necn spoke with one woman who lives near the train tracks. Jordan McCoy says she rushed outside when she heard the emergency sirens. "We were like, 'Oh, this is really serious,'" she said. "We just saw the train right here, and then there was police cars over there." The incident occurred just before 7:30 p.m. on the Cape Cod Central Railroad track, where the victims, a 36-year-old man and a 33-year-old woman whose names have not been released, were shown to be trespassing. Nia Hamm reports from Wareham, where police are still searching for answers as to why two people were on the train tracks to begin with. No one else on the train was injured. The Polar Express-themed train ride that began in Buzzards Bay was right back where it started roughly 30 minutes after departing on its final dress rehearsal for the holiday season. The ride was free for all passengers, a group consisting of first responders and their families. The train detached from its engine and returned to the Buzzards Bay depot, where passengers who were on board were able to get off the train and return to their vehicles. Christmas lights could be seen lining the guardrail as the families deboarded. Cape Cod Rail issued a statement on the incident early Sunday morning. "Tonight, during our final dress rehearsal for our holiday themed event, 'The Train to Christmas Town,' unfortunately two trespassers were struck while we were traveling on our tracks," the statement reads. "We had invited over 300 first responders and their families aboard our final dress rehearsal of the season. This is our way of giving back to those who give so much to our local communities. On our way to the north pole this evening, we came upon trespassers who were on our tracks. Sadly, tragedies such as this could be avoided if people would not trespass on train tracks. No passengers were injured in this incident and the staff did their best to distract the children from the sad reality which was occurring outside." The 355 people, including 100 children, on board made it out okay. Massachusetts State Police and the MBTA are assisting Wareham Police with its investigation. Richard Carvalho, a resident of Buzzards Bay, wondered how two people could be walking down the tracks but they didn't hear a train coming. "It's sad but it seems like every week we hear about somebody getting hit by a train," Carvalho said. Ed Hoitt, another Buzzards Bay resident, said that the train has operated for several years without any other problems and he doesn't see it stopping now. "I don't think they're going to discontinue all that," he said.